Thread: Shinnok vs. Shao Kahn: Who started invading first? This is a debate that comes up from time to time, and with the hype of both of these characters returning for MK11, seems like a good time to explore this subject and settle it once and for all! 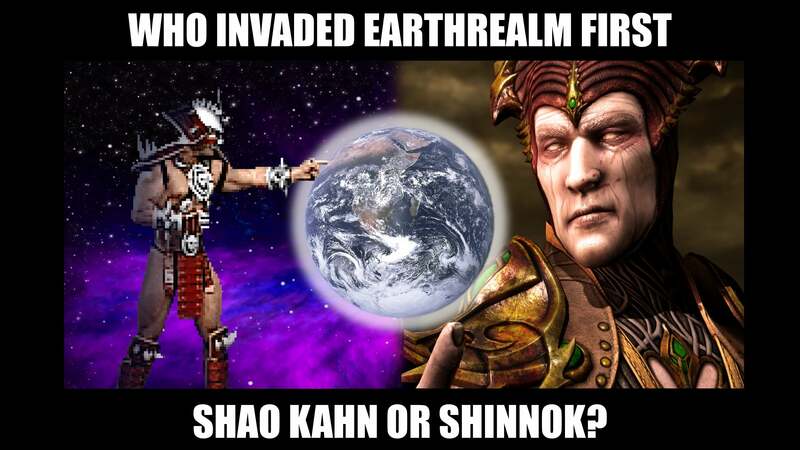 Re: Shinnok vs. Shao Kahn: Who started invading first? MKX is very clear that "Shao Kahn followed Shinnok's footsteps". 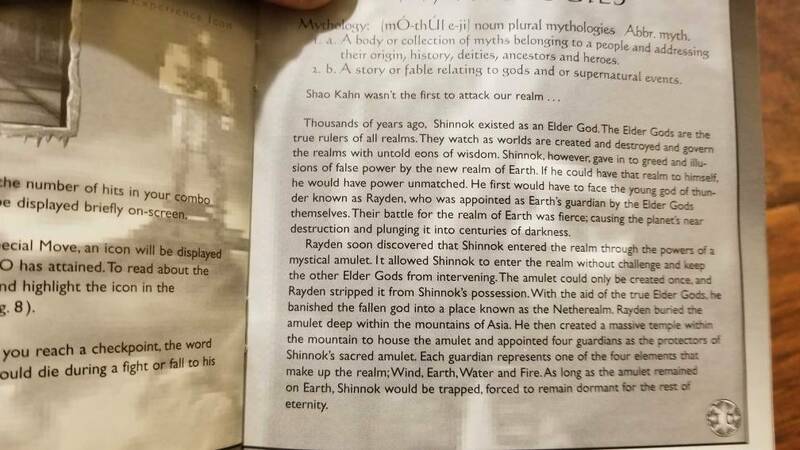 Also, in MK:A, Taven knows Shinnok from the times where he was alongside the other Elder Gods, and Shao Kahn wasn't an invader of Earthrealm at the time. After Argus captures Taven, he still mentions that Shao Kahn showing interest on Earthrealm (where Taven was) was "very unlikely", as he was still occupied with Edenia. Let's also consult the original instruction manual of Mythologies. Yes, of course Shinnok attacked Earthrealm before Shao Kahn. We know all this happened 10.000 years ago. So, Shinnok must have attacked Earthrealm around that period too, cause it was after Shao Kahn attacked Edenia. All evidence points to this from what Raiden says in MK4. Then, Johnny Cage t̶h̶e̶ ̶w̶r̶i̶t̶e̶r̶s̶ got drunk and said it was "millions of years ago" in the intro of MKX. Naturally I'd rather take Johnny as an unreliable narrator who would only know the stories he had been told and I chose to believe Raiden in the intro of MK4 and the Mythologies Book, which give the First War with Shinnok at "thousands of years ago". Last edited by mattteo; 04-10-2019 at 10:44 AM. Johnny Cage isn't the only one who claimed Shinnok's attack to have happened millions of years ago. Shinnok made the same claim in his own MK4 ending. 1. this is coming from a person who had been trapped in Hell and originally tormented there by Lucifer. So he could actually be saying how it felt to him. 4. in order for things to make sense, like I said, for Fujin not to be stuck in a Temple for millions of years and Raiden to be guarding over HomoErectus and Neanderthals, for Reiko not to be millions of years old and for Argus of Edenia not to have lived for other millions of years more after already being old in the Armageddon konquest mode first scene, then it has to be "thousands of years ago", not "millions of years"
Of course that Shinnok ending is important. I specifically made reference to that as well. I included it at 2:53. I definitely made sure to cover all this stuff! And more! I'm pretty sure I didn't leave anything out that was super-releveant. @Tabmok99, you know I have the utmost respect for you. Your video was at a high standard, as always. I may not agree to the conclusion you reached, but you do know the MK lore perhaps better than anyone. I really enjoyed the vid. Maybe you could have gone more in detail about the consequences on some characters if that had happened millions of years ago instead of thousands. You could have brought up how many characters should be millions of years old. 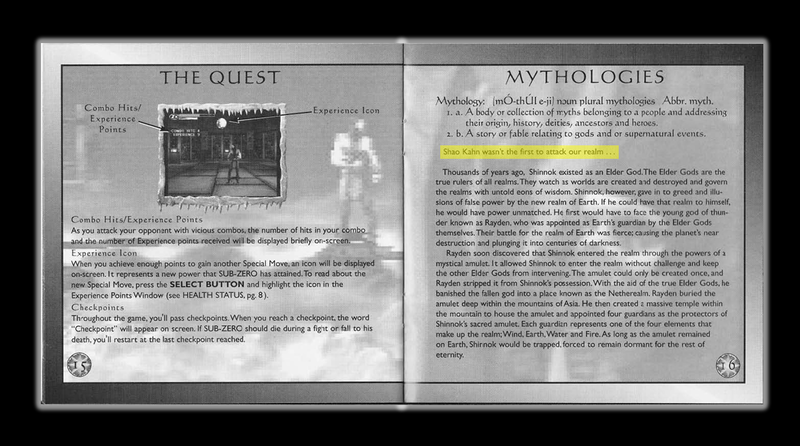 We know of Raiden (described as a young god in the Mythologies book, but that wouldn't contradict anythhing either way), Fujin, Reiko, but also there was Argus, Daegon would be millions of years old if he was awakened soon after entombement, Shao Kahn would have been trying to take Edenia for millions of years (nah, Shao Kahn would never have that patience), Onaga would have been in imemorial times, not able to find a worthy champion like Shujinko to gather the kamidogu all this time. Even Rain would be millions of years old if we go by his MK9 vignette and the War between Edenia and Shao Kahn wasn't exactly 10.000 years ago. Maybe when we say the numeber "1 million" it doesn't seem a lot, but if you really think about it, 100 years is already a long time. The wise masters of the shaolin are almost 100 years and they are very old. 1.000 years is almost only for great characters in the lore, like Shang Tsung or probably Bo'Rai Cho. Goro is 2.000 years. 10.000 years....well, imagine how much knowledge someone would have in 10.000 years. We have Kitana, the other Edenians, only Raiden, Shao Kahn, Shinnok, Fujin and Reiko are older than this. Ok, Sindel and King Jerrod in the form of Ermac too. But to go further than 50.000 years...... there aren't even record of human civilization on Earth more than 10.000 years ago. To go 100.000 years into the past, or 500.000 years or 1 million years is such a long time that those characters wouldn;t be humans anymore, they'd have transcended to something else, something with much more knowledge. Let alone not 1 million, but 45-65 million years into the past. So, 45 or 65 times that gigantic number 1 million (which by itself is unthinkable in terms of human life and knowledge).......how can we imagine that Reiko or Fujin are that old? Kotal Kahn... a relative of Shao Kahn? The Konqueror himself?